Since it’s the ‘off season’ I will share a story here to fill the void a bit. It’s not F1 related but you won’t mind. I began this one on the holiday break but was unable to finish it any sooner. I started this one while I was writing a different, bigger, story but unfortunately my buddy @wtf_f1, who does my editing, took some personal time off. So that one will be pushed back some time. This one will be unedited, so forgive me if there are any errors. But apart from that, enjoy the read. It has been a while since I wrote a Jacky Ickx story. To showcase Jacky’s versatility I think I’m going to make this one about his Dakar adventures. You already enjoyed two of his Le Mans victories here, time for something else. And from one end of the spectrum to the other is something fun to do, as both of the races are considered the hardest/difficult of their kind. As we all know such promises get made every year around that time by millions of people. The content of the idea varies a lot, but the concept of an empty idea stays. Some decide to quit smoking, others to work out more and eat less. These two decide to partake in one of the toughest races, known to mankind, in the motorsport part of life. Only this time it isn’t an empty promise. This time it are two friends who decide they’ll drag each other along for the ride. They take it up a notch and go from making plans to taking actions. First thing they do is start searching for a car. Not the least important part of a race, if you ask me. Through Ickx’ commercial contacts they get a hold of a Citroën. A Citroën CX. A simplistic berline with only two wheel drive. Of which they put two on the start list of the big rally raid. Ickx thought of the car because the CX 2400 GTI had a hydropneumatic suspension. Meaning that the car had a system where a pump, which is driven by a belt or camshaft connected to the engine, pressurised a hydraulic fluid. That fluid pressure is, in turn, used to power the suspension. –For those of you who want to know more about this I’ll include a link to Wikipedia. Hydropneumatic suspension -. It’s an interesting concept. 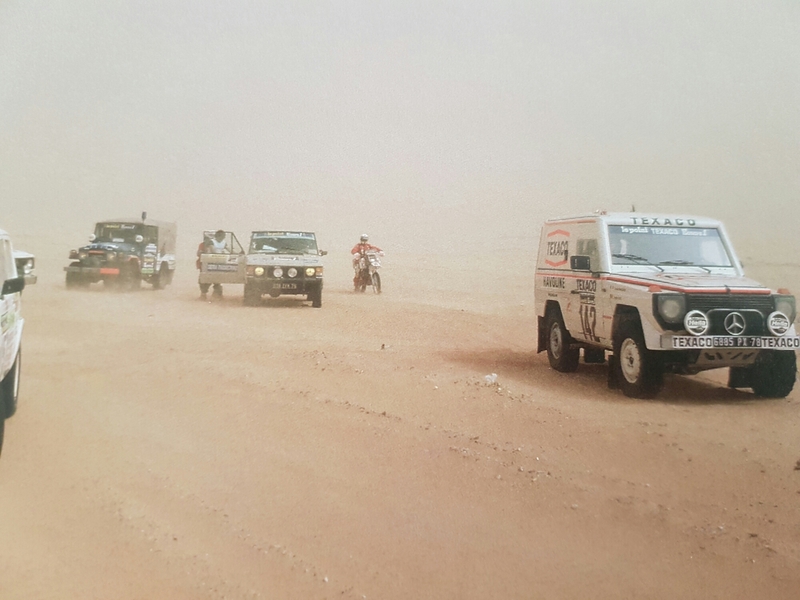 It took Ickx little effort to persuade the Citroën bosses to partake in this adventure, since they knew about the commercial opportunities the rally raid brought with it. After he got Citroën on board he went on to find further funding for his project. Therefore he knocked on the door of his friend John J. Goossens, a belgian who was, at that time, head of the marketing department of the oil company called ‘Texaco’. Goossens knew, just as the people at Citroën, how much media attention the race got and was happy to make a deal with Ickx. In the mean time Ickx was still a professional driver, but he had made a decision not to drive endurance anymore. Something Porsche still couldn’t comprehend, as they still believed in his capacities. 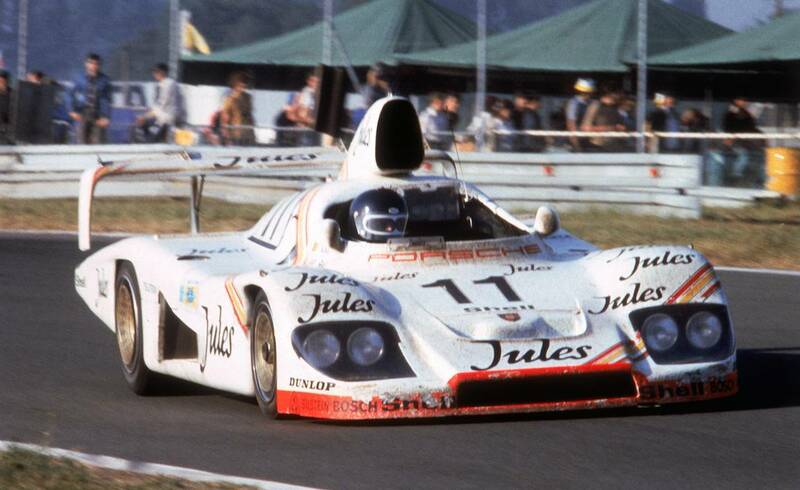 Porsche on the other hand had promised to support Reinhold Joest in his project of reviving an old 936, which they named a 908/80 because Porsche didn’t officially sell 936’s, to race at Le Mans. What this has to do with the Ickx story, you ask? 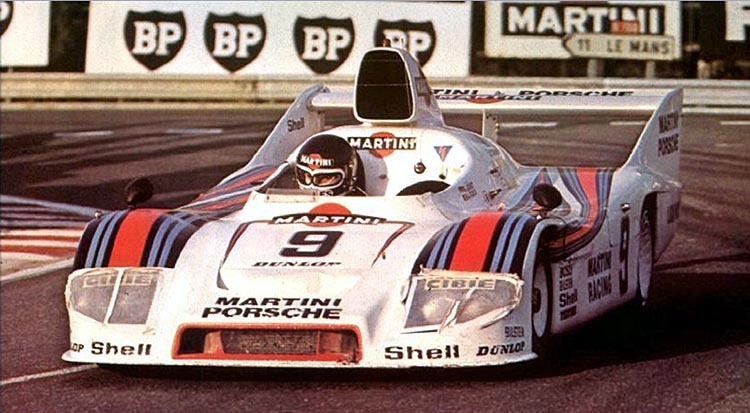 Well, Martini jumped on board for this project but they’d only bring in the big bucks if Ickx would drive. And they tempted Jacky by playing on his ego. Why would he quit when he could chase the ‘all time win record’ at Le Mans? And it worked. Racing drivers are men with an ego, perhaps even more than the mere mortal who walk this earth. Ickx found a challenge in the project and agreed to drive with Joest. Eventually they only finished on p2 but meeting his old flame, which Le Mans most definitely was, did make him want more. The illustere record had to be broken! 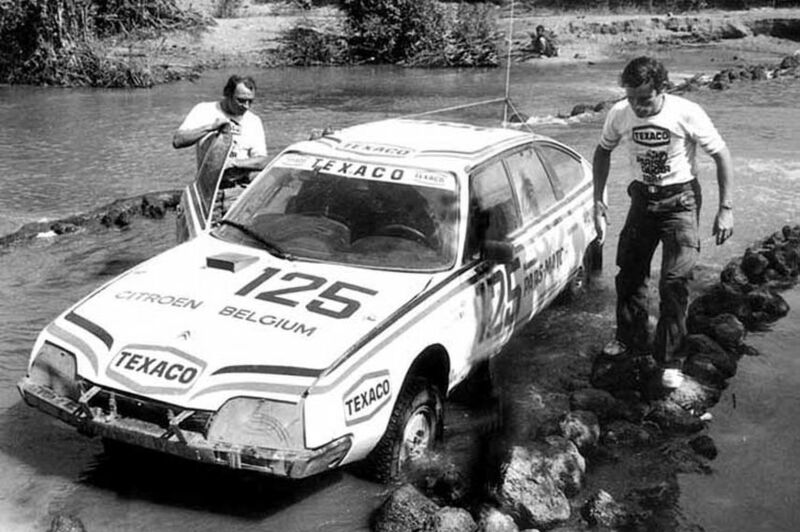 Onwards to the first January of 1981, when both Ickx and Brasseur started for their first Paris Dakar rally raid ever. As predicted by both companies the media jumped on board, not only for our driver and co-pilot, but for the whole race. But where as the the start of the rally generated a lot of fuzz for the media, both Ickx and Brasseur thought of it as pretty mediocre. Both of them knew Europe and weren’t too impressed by it. It wasn’t until they got past the Mediterranean Sea that a wonderful new world presented itself to them. Images on the horizon they’d never seen before, stunned them. 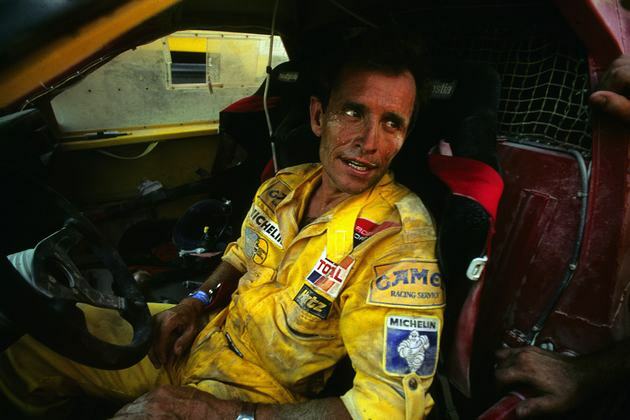 It was around this time they really first met Thierry Sabine, the founder (and main organiser) of the Paris Dakar rally, apart from during driver meetings. Now, what some of you might not know is that Jacky Ickx started his motorsport career on two wheels. Most people only credit John Surtees as the Formula One driver/ motoracer combo, but that’s a misconception… Surtees was the most successful one, winning championships on the highest level of both branches of motorsport, that take place on a circuit. Ickx, however, started his career on a trail motorcycle. 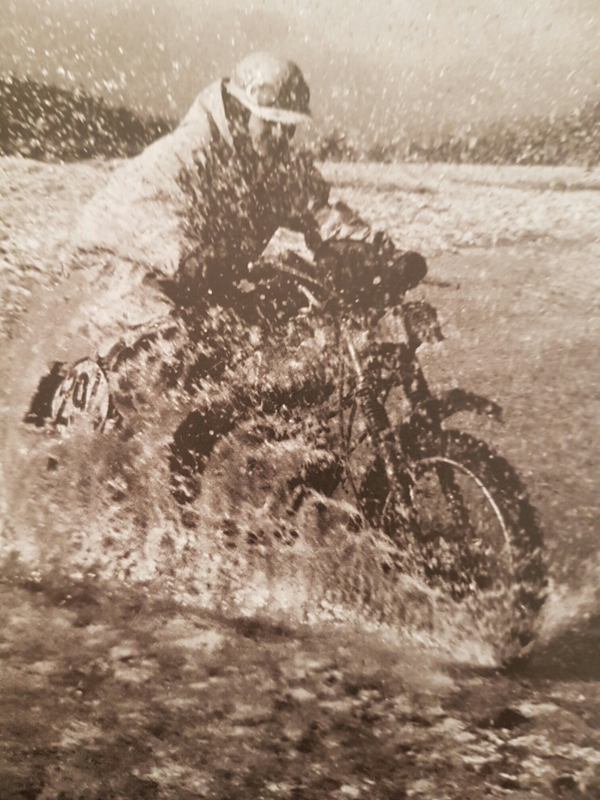 Becoming Belgian champion on the young age of 16, perhaps laid down the foundation of his career towards off roading. He himself, credited it as one of the reasons why he felt like a fish in the water once they entered Africa and it’s harsh environments. The elements take him back to his essential racing experiences. And it enables him to bring the Citroën, and it’s rather inexperienced crew, round all the obstacles thrown at their feet. Remember that Brasseur, as an actor, never experienced anything like it. However both men catched the virus that is the Paris Dakar rally! The fact that they had to give up at their first attempt due to a crash doesn’t change that fact one bit. Back to his old flame, the mistress called ‘the 24 hours of Le Mans’. Determined to make up for the “failure” of the previous year Ickx convinced Porsche to take part in the most prestigious endurance race of the world. With him he brought the backing of Dior who just released a new parfum called ‘Jules’, which will give the car an ugly livery if you ask me, but who am I. Once again Ickx succeeds in convincing someone of a project he wants to do, this time round it is Porsche, and they agree to dust off an old 936. The engineers and mechanics of Porsche are thrilled that they’ll go back to Le Mans once again and do their absolute best to provide the Belgian with a car capable of winning. Now, it’s only fair to admit that the field at that particular race was one of the weakest ever… So Ickx (and Derek Bell) seize the opportunity and stormed off to the finish line and grabbed the win, which resulted in Ickx becoming the driver with ‘the most wins’ record at Le Mans. Coincidentally he snatched the record from a fellow country man, called Oliver Gendebien. Who also had been a Ferrari F1 driver, and was the previous ‘best’ Belgian in the world of motorsport. Small detour from the original story, let’s get back to that one, shall we? So Ickx and Brasseur returned to Paris, this time with more experience and a Mercedes instead of a Citroën. But still with Texaco backing, someone has to bring in the money, am I right? When they rolled up to the first start on the 1st of January 1982 they were in a 4×4 Mercedes 280 GE. This time the rally got even bigger and was considered as one of the biggest races of the year. It seemed they got stronger and better with every heat, not only on driving skills but on the navigation side of the race too. With the outcome that they also started winning heats, this time round. In the end they even finish the rally in p5, even with a five(!) hour penalty for missing a checkpoint. If they weren’t in love already they sure as hell would be now. Which didn’t make it difficult for them to decide to try again next year. Fast forward to new years day 1983, when both men are, once again, present at the start in Paris. Third time’s the charm. And, for the second time, they’re to be found in a Mercedes 280 GE. Ready to start their big African adventure, along side 385 other vehicles. A massive number of contestants for what was only to be the fourth running of the rally. But the numbers of spectators that gathered to see the cars, bikes and trucks were even bigger. All of them gazing upon the colorful liveries dominated by sponsors. The generated media attention drew the sponsors like moths to a flame. And all of this for a race that’ll last for 12,000 km. Albeit “only” 5210 km will be against the clock. Those 12,000 km will take the contestants through 7 countries, namely France, Algeria, Niger, Burkina Faso, Ivory Coast, Mauritius and Senegal. Like a true field marshal Thierry Sabine spoke to the contestants of his race, letting them know that he intended the race to be for amateurs. Even when he did not have a problem with professionals joining in, he still wanted them to acknowledge that fact. And last but certainly not least he wanted them to have fun, and that they should make the ones that stayed home dream! Everyone should have a dream, and who knows by living their dreams they might inspire others to do the same. His search continues for four (!) days. Talk about true dedication for his men. On the 20th January 1983 it’s the Mercedes with no. 142, driven by Jacky Ickx and Claude Brasseur which takes the victory. In front of a Lada in second place and a Range Rover in third. This victory makes Ickx the first Formula One driver to win the Paris Dakar rally. That he partnered up with an actor creates even more of a fuzz in the media, bringing attention to the race like never before. When Ickx comes home he already starts planning his next Dakar adventure. This time he wants to do the rally in a Porsche! Of course Porsche is reluctant to join at first. They have virtually no experience in that kind of rally, apart from one East African Safari Rally. But Ickx won’t take ‘No’ for an answer. Oh no, he goes out of his way to convince Porsche that a ‘four-wheel driven 911’ won’t have to admit that any of the traditional ‘all terrain vehicles’ will be it’s superior. When the Porsche directors board finally agrees Jacky Ickx gets to lead the project, which Rothmans, immediately, agrees to fund. Both Ickx and Brasseur will be competing with the new found ‘Jacky Ickx Racing Team’. As it turns out the competition was wrong to give Porsche no credit. In their first attempt they win the rally, though not with Ickx and Brasseur. They only finish sixth with various mechanical problems. The first place goes to René Metge and Dominique Lemoyne. Effectively pushing Porsche head-on in to this African adventure. To nobody’s surprise they turn up at the rally in ’85, again with the 911. Unfortunately for them this became a race to quickly forget. That’s why we will fast forward past this failed attempt on to 1986. The year Porsche turned up in what, at least to me, would become one of the most iconic Porsches ever made. The 959, which would be extremely advanced, far ahead of its time. Even the “normal” road car was something else! This time round it would be, once again, Metge who takes the first place in front of Ickx. He even gets an average speed of 230 kph through the Ténéré desert! At first it looks like the Rally would not recover from the loss of its “father”, who made the Dakar his magnus opus. But under impulse of Thierry’s father the rally raid gets saved. The movement started by Thierry would never be the same but it would still be there. His actions generated one of the biggest races ever, which still exists today. Albeit not in Africa anymore. Which seems odd to me, but that’s besides the point. But, as luck would have it, Ickx had a friend called Jean Jacques Poch, who at the time, was the man who brought Lada’s in to France and Belgium. He offers his friend a Lada to partake in the next Dakar, and that’s something Ickx can’t turn down. As a new co-pilot Ickx goes for a real life pilot. 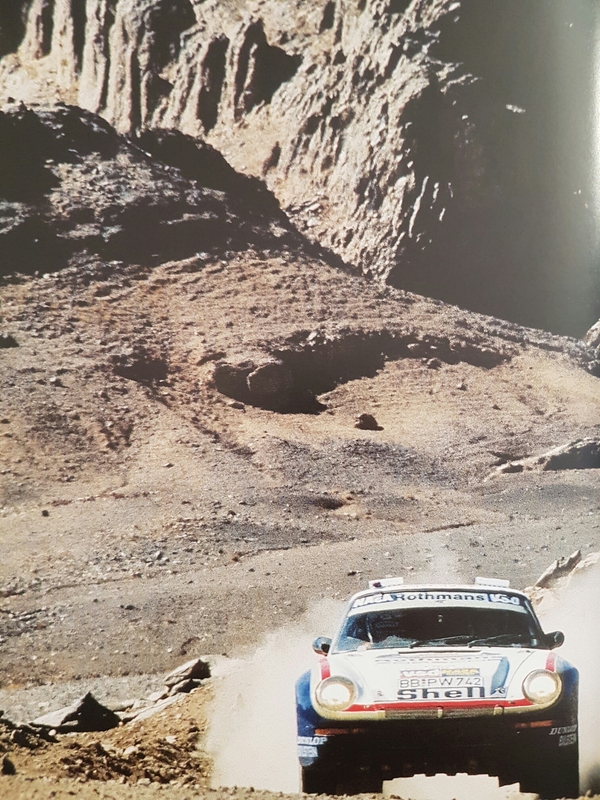 One who has been flying over the Dakar for as long as it exists. Flying journalists and VIP guests over the deserts gave him the bird view of the parcours. But this time Christian Tarin won’t be flying overhead. This time he’ll be navigating, something wich he loved to do too. Unfortunately for both Ickx and Tarin their first attempt will be a rather short one. A broken camshaft forces them to give up. Having problems with their Lada would happen again, at the next Dakar. This time it won’t be one big problem but a series of smaller ones. Limiting their success to a disappointing 38th place in the final standing. But the good news is: by bringing Porsche to the Paris Dakar rally, Ickx sets a new benchmark to which the race will be held from now on. What once was a race for amateurs becomes a professional target for a multitude of constructors. Especially when the best rally division there ever was (Group B) gets the axe, because it would be labelled too dangerous. 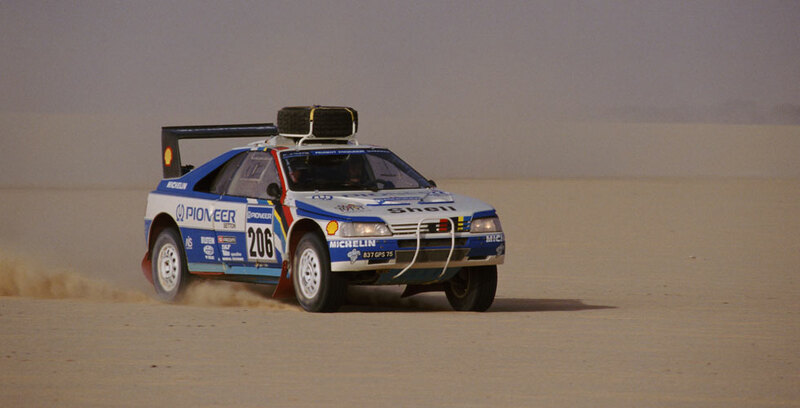 So in ’89, after the fall of the group B rally empire, Peugeot decides its new target will be the Dakar rally raid. Back then the big man at Peugeot’s sport division was our friend Jean Todt. Some of you might have forgotten this, or are too young to remember, but before Jean ‘the president of the FIA’ became that president or the napoleon of Ferrari he had a rich filled career at Peugeot’s gravel adventures. Little tip for you who didn’t knew this, click this link: Climb Dance This will for ever be my favorite clip of racing. A Peugeot on steroids. On the good side of 600bhp, and on the better side of 900kg. Four wheel drive and four wheel steering! Peugeot were the first to do this on a rally car, by the way… And then up that illustrious mountain. Just thinking about it makes me drool! So even if you did knew about it, click the link anyway, and thank me later. It will all go down as a duel between Jacky Ickx and Ari Vatanen. Vatanen who was undisputed no.1 driver of the team before the Belgian got on board. And who still wanted to be just that. But Ickx had been up against some of the greatest before, so why would he back down now? 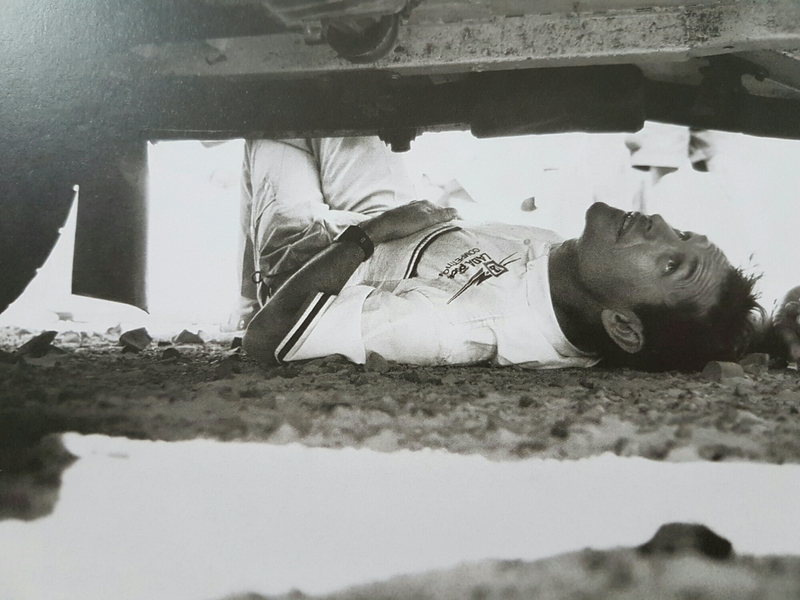 But that it’s going to be a clash of titans is visible in the prologue, when Vatanen rolls his car in an attempt to show that he’s the man to beat. When he, again, loses time, this time in the Ténéré desert, Ickx gets the lead. Both men are giving it all they got. When they leave Mali it is Ickx who is ahead in the standings. But it’s a though battle. One Todt hates, and the viewers love! The Finnish rally world champion of ’81 against the Belgian six time Le Mans winner. But boring old Jean wouldn’t be himself if he wouldn’t try to take the fun out of it. The chance of losing one (or two) car(s) due to a proper fight is something he hates. So what does he do? He flips a coin in order to decide who’ll win this Dakar edition. I kid you not! A coin, and Lady luck, decides that it’s Vatanen who’ll take the victory. But the Ickx- Tarin duo only gives up the lead in the closing stages of the race, when they can almost smell the podium, on the banks of Lake Rose. Sadly enough this would be Ickx’ last really competitive Dakar race. By now he would be in the autumn of his career. And when he loses his friend Christian Tarin in ’91 in a big crash during the Pharaons rally, during which he was behind the wheel, it would be the direct reason for Ickx to quit (professional) racing all together. Trying to follow international motorsport was a massive challenge back in the 1980’s down here in the Antipodes. Nothing on the teev, scant mention in the local newspapers, magazine articles were just about all there was really. And the ‘annual’ / ‘yearbook’ thing, I guess. I remember I had a Rothmans 959 poster on my wall, next to an Shell RS500 Sierra and a JPS E30 M3. They showed some of the footage of the 1982 dust storm during the highlights of the rally this year…really scary stuff! At least we got to see the Peugeots take it down to the wire this year with no coin tossing to decide the outcome: Mr Dakar vs Mr Rally…Peterhansel just scraping in with his consistency but Loeb pushing him all the way! Lovely video too:) I have seen it before but always nice to watch it again. Thanks Jennie. These are always fun to do! Dope years. I hope nous accident this years.